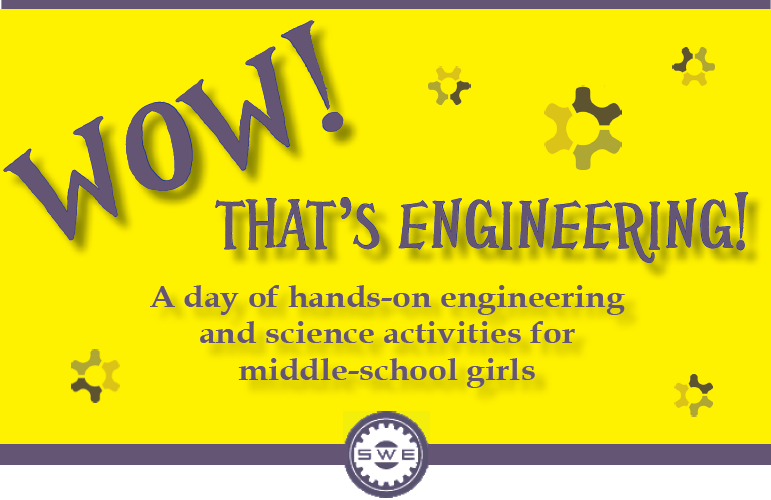 The Society of Women Engineers (SWE) Boston is pleased to invite you to Wow! That’s Engineering! on Saturday, March 19, 2016 at MIT Lincoln Laboratory. It’s an event for middle school girls (grades 6-8th) to partake in activities where they will have the opportunity to meet women engineers and technologists and hear first-hand about these exciting career paths. Through hands-on activities and interactive demonstrations, the girls will be able to experience the creativity and innovation that occurs in the engineering and technology fields. Registration includes snack, lunch, and workshop supplies. Please note that a parent/guardian must sign a permission slip and photo release form for a student to attend this event. Bring all necessary paperwork with you to the event. Parents/guardians are expected to drop off students at 8:30AM and pick up no later than 3:30PM. Space is limited and no day-of-event registration will be available. Sorry, no refunds will be available for cancellations. Event sponsored by the Society of Women Engineers and MIT Lincoln Laboratory. We greatly appreciate all of the support we get from the community. Thank you to everyone who helps spread the word about our events. To advertise this event with your community, ﻿click here﻿ to download the event flyer. We need volunteers to fill the roles of workshop assistants, demo assistants, registration, passing out lunches and goodie bags, and much more! Please enter MIT Lincoln Laboratory parking lot at the 244 Wood Street entrance and park in visitor parking. The entrance to the cafeteria is on the lower level, take the outside stairs at the left of the main entrance. * Take Exit 31B onto Routes 4 and 225 toward Bedford. Stay in right lane. * Use right turning lane (0.3 mile from exit) to access Hartwell Ave. at 1st traffic light. * Follow Hartwell Ave. to Wood St. (~1.3 miles). * Turn left onto Wood St. and drive for 0.3 mile. * Turn right at the Lincoln Laboratory Wood Street Gate. * Take Exit 30B onto Route 2A. Stay in right lane. * Turn right onto Mass. Ave. (~0.4mile - opposite Minuteman Tech). * Follow Mass. Ave. for ~0.4 mile. * Turn left onto Wood St. and drive for 1 mile. * Turn left at the Lincoln Laboratory Wood Street Gate.